These easy exercise options will help you work a fitness routine into your new life with baby. “Women who were active before and during pregnancy and had no complications during delivery can start exercising again as early as two weeks after giving birth,” says Dr. Julia Alleyne, medical director of Sport C.A.R.E. at Sunnybrook and Women’s College Health Sciences Centre in Toronto. If you weren’t exercising before, talk to your doctor before your first workout. Whether it takes you weeks or months to muster up the energy to exercise after giving birth, ease back in with light activities like walking or swimming. Experts say you should avoid high-impact exercise because your body will continue to produce the hormone relaxin until you finish breastfeeding. Relaxin makes your joints and ligaments less stable, which puts you at greater risk for injury. Alleyne recommends ten to 15 minutes of low-impact activity three times a week. Gradually progress to exercising ten percent longer each session. So if you exercise for ten minutes one day, go for 11 the next. 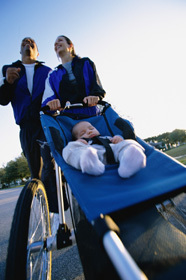 Walking is a convenient way for new moms to get fit because you can bring the baby along in a stroller or carrier. For the best results, walk at a brisk pace and vary your speed and route, says Alleyne. For a workout that’s easy on your body, try swimming. The buoyancy of the water will support your joints so there isn’t much stress on them, says Alleyne. Cardio workouts in the water are a great way to lose weight, get your heart rate up and really work your muscles. The water offers resistance but the exercise is non-weight-bearing, which means you get all the benefits of the movement without putting extra strain on your body. Classes are also available that include the baby — but then your baby’s comfort level in the water will determine the length of your workout. Activities that combine relaxation with stretching and strengthening are a perfect fit for new moms. Tai Chi, a series of slow, gentle movements that work your muscles and stimulate circulation, is particularly good for women who weren’t active before or during pregnancy. “It’s incredibly relaxing and dramatically reduces stress,” says Vancouver Tai Chi instructor Keith Jeffrey. Yoga is also a great option for new moms. Bit by bit, it tones the abdominal muscles, which tend to get out of shape during pregnancy. Besides building muscle strength, yoga increases flexibility and relieves aches and pains. Just about anyone can do yoga, including women who weren’t active during pregnancy. But when you’re unfamiliar with the practice, you may have a tendency to overstretch your joints, so tell your instructor where you’re at postpartum before starting classes, advises Alleyne. Women who have had a Caesarean section should also talk to their yoga instructor before working the abdominal muscles. Whether you try walking, Tai Chi or swimming to get active after having your baby, the key to sticking with exercise is finding something that feels good for your body, says Alleyne. Shop around until you find something you like to do. Listen to your body during exercise, drink lots of water and pause when you need to. It’s supposed to be fun!